Cousin Linda is preparing to fly home to Illinois, and that was a good reason to meet up one more time in AR to say “Until next time…”. Greg and I met Pam and Linda at Pam’s pretty home in Bella Vista. 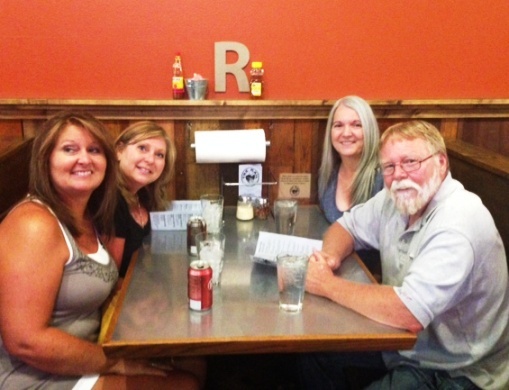 Together we traveled to the historic downtown Rogers, AR, for a fun meal at The Rail – A Pizza Company, and a first for me. 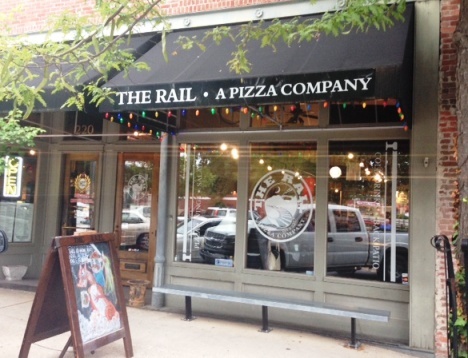 The Rail, located at 218 S. First Street, is one of the hot spots in downtown Rogers. Housed in an older building with exposed brick walls inside, this is a cool place to gather for pizza, wings, cold drinks and dinner with friends. Or cousins, in my case. I love these historic buildings with their long narrow interiors. We slid into a booth and perused menus, conveniently located on the table. Our waiter was friendly and attentive. He kept our drinks filled and answered any questions we had. We ordered a cheeseburger pizza and The Alfred, a pizza featuring chicken, onions, mushroom and Italian sausage with an alfredo sauce. Both choices were excellent. 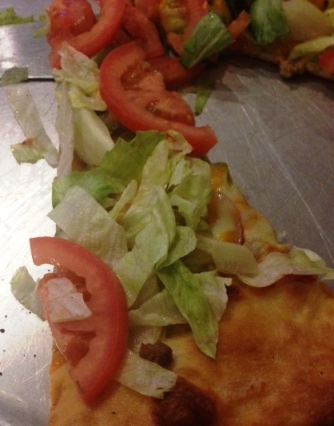 The cheeseburger pizza even had dill pickles and mustard on it. Our barbeque wings were a great start to the meal. The wings were pleasantly crispy with a tangy and sweet mild sauce. We arrived early for dinner and we were fortunate to do so. The tables and booths very quickly filled up. There was a festive, chatty atmosphere as people sampled an assortment of cold beer and soda and chowed down on pizza. We had our own little party going on at our booth, as we shared pizza, chatted and laughed. Pam introduced me to a new use for those left over crusts of pizza. Each table or booth had a bottle of honey present. She instructed us to save our crusts and dribble honey over them for a simple dessert. Another first! I had never seen this done before, at any of the pizza establishments I’ve been in. After letting my dinner settle for a few minutes, I tried a honeyed pizza crust. It was delicious and just the right finishing touch to our meal. This is a suggestion every pizza place could adopt! We drove around downtown Rogers before heading back to Pam’s house. There were many cute and interesting shops to explore at another time. As the sun set, Pam directed us home via scenic back roads. NW Arkansas really is beautiful, well deserving of the nickname, The Natural State. I didn’t realize, until this evening that Bella Vista has several small but deep lakes in the area. We drove by two and I appreciated their peacefulness and beauty. It’s been fun to spend time with Greg’s cousins the past few weeks. I enjoyed the holiday at the lake house near Lawrence KS and the excursions in NW Arkansas. And of course, it is the connections with people that makes these times memorable. I hope to see Linda, Tim and Mark, and their spouses and families, again soon. And Pam and her husband Jay, I’ve discovered, are a mere 40 minutes away down I-49. I intend to see them often. So it’s not goodbye. It really is see you later.